We scientists often, and rightly so, complain that even the best of our lot are hardly known to the man on the street. How many of my non-scientific friends and relatives, even otherwise highly informed and well-educated, have heard of Hans Bethe, Robert Woodward, Ernst Mayr or even Freeman Dyson (who has written great popular books)? The truth is that the number of scientists who are famous enough to count in the public imagination can be counted on your fingers. I feel saddened by this fact, but also realize that this situation is not going to change anytime soon; Bob Woodward the journalist would always be more widely known than Bob Woodward the chemist. And in any case, it's much better to do your part in publicizing the achievements of great scientists than to keep on lamenting their lack of recognition. “We arrived at the night club and Armstrong was already playing. I introduced Bob to my friend saying, “This is Bob Woodward.” My friend turned around impatiently, shook his hand, and returned his attention to the music. 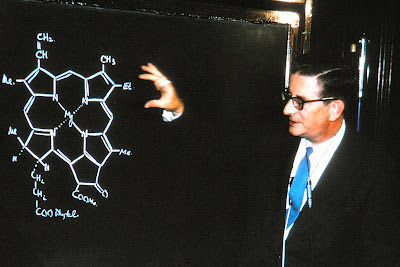 I said, “Look, Bill, Bob Woodward is to organic chemistry what Louis is to the trumpet!” At that my friend turned around slowly, looked Bob in the eye, and said, “Man, you must be one hell of a chemist!” Bob said he thought that was the most sincere compliment he ever got." Well done. Although I will say that it was Louis Armstrong who was the Robert Burns Woodward of jazz. Reference: Blout E. Robert Burns Woodward. Biographical Memoirs of the National Academy of Sciences, 2001; 80.